Rock, Paper, Scissors – The eternal struggle between good, evil and mediocrity. Or so my mother said. 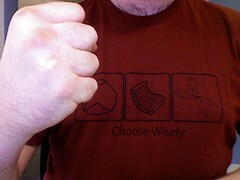 “Choose Wisely” is the first tee that I’ve bought from Snorg Tees and it’s pretty nice. Whilst the triptych is fairly simplistic, the icons are recongisable enough surface that childhood memory of managing to win five games in a row just by not opening your hand. Of course, then some numpty would inevitably decide to introduce a “black hole” or other ridiculous game mechanic, turning the game of mental dexterity into a travesty. As with all of snorg’s shirts, this is printed on a nice American Apparel tee, and is available in both men’s and women’s styles. Men’s shirts come in a choice of “cranberry” or “natural”, and women get a “hot pink” shirt. Why can’t men get that option, eh? I’d honestly rather like to have a nice hot pink tee in my collection, but maybe I’m a special case. 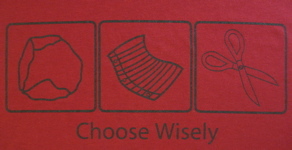 “Choose Wisely” is available from Snorg Tees, and costs $16.95. Hush you! There’s nothing wrong with a nice hot pink tee on a chap.